Fiction – paperback; Pushkin Press; 336 pages; 2015. Translated from the Swedish by Peter Graves. 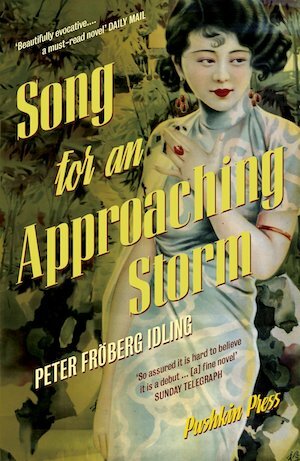 Peter Fröberg Idling’s Song for an Approaching Storm is set in Cambodia in the summer of 1955. It tells the story of a complicated love triangle between two political rivals and a beauty queen, but it’s also a powerful evocation of a country at a pivotal point in its history: its first ever democratic elections following independence. First, some (brief) history to put the story in context. The Kingdom of Cambodia was granted independence (from France) in 1954 following the Geneva Conference, which was designed to settle issues resulting from the Korean War and the First Indochina War. The following year, in early 1955, King Norodom Sihanouk abdicated, in favour of his father, so that he could found the Popular Socialist Community Party (commonly known as the Sangkum). This would ensure Cambodia remained a constitutional monarchy (modelled on the UK system) and would rival the left-leaning Democratic Party, which was pro-independence and sought to abolish the monarchy and set up a republic. The election campaign, which preceded the country’s first democratic election after independence in September 1955, was marred by violence and bloodshed as rival parties fought to be elected to a 91-member National Assembly. The prince’s party won all 91 seats. When Song for an Approaching Storm opens there’s just one month remaining in the election campaign. The novel, which spans the 30 or so days leading up to the actual poll, is divided into three parts and each part is told from the point-of-view of a different character. In part one, Sar is leading a double life as a well-respected school teacher who is officially campaigning for the opposition, but behind the scenes he’s helping an armed Communist network that seeks to take over the Government. He’s engaged to Somaly, a striking young woman who won the Miss Cambodia beauty contest, but their relationship is unravelling and he’s not sure what to do about it. Some 20 years later he will reinvent himself as Pol Pot, the leader of the deadly Khmer Rouge. In part two, we meet Sary, the ruthless deputy prime minister who is a close ally of the prince and is hell-bent on ensuring that his party stays in power at whatever cost necessary. He’s married with children, but that doesn’t stop him pursuing Somaly who becomes his lover. And in the final part, we hear from Somaly herself and discover her affection for both men and her deep desire to be independent in a restrictive society that imposes strict rules on a woman’s behaviour and lifestyle. As a love story, Song for an Approaching Storm is a fascinating read, but as a political thriller — complete with betrayals, bitter rivalries, house arrests and murder — it is absolutely gripping. Told in rich, languid language, albeit in short, fragmentary sentences (all beautifully translated by Peter Graves), it almost reads like poetry. Admittedly the first part, told entirely in the second person, is a challenging read and there were a couple of times that I considered abandoning the book because I couldn’t get a handle on it. But by part two, which is told in the more comprehensible third person, the story really came alive for me and I ate up the remainder in two (longish) sittings because I was anxious to discover what would happen next. This is my 4th book for #TBR40. I purchased it late last year in preparation for a week-long trip to Cambodia (I visited Phnom Penh and Siem Reap between 20-27 January 2019) because I always love to read books set in the places I’m about to visit / have visited. It certainly helped my comprehension of this story by knowing a brief history of Cambodia, which I learned during my travels, and of seeing some of the places mentioned in this book. One for the wishlist, and a country I know shamefully little about.Super review. Thanks, Annabel. Cambodia is a truly fascinating place. I loved my trip there and learned so much. Sadly, it doesn’t have much of a literary tradition so there’s no novels in translation (apart from those written by expats and usually about modern Cambodia, post 1975 when Pol Pot was in power) to help us learn more about it. I’ve read a couple of memoirs and will post about them soon. I like doing that too, reading in anticipation of travel and especially finding books when I’m there by local authors. Is there anything written that indicates why the author’s particular interest in Cambodia? Unfortunately Cambodia does not have much of a literary tradition, so local books by local authors are rare, and none, that I know of, have been translated into English, apart from a handful of memoirs about the Pol Pot years, which I’ve now read and will review soon. The Swedish author of this book lived and worked in Cambodia for a couple of years (as a legal adviser to a human rights organisation) and was intrigued to examine what turned Pol Pot from a well respected school teacher into a genocidal mad man. His theory is that the switch in demeanour occurred because of a broken heart, hence the focus on Somaly in this fictionalised account. Oh how interesting and frightful at the same time. The world and it’s occupants need so much healing. To turn the focus inward rather than blame outward. Thanks for sharing that bit if extra insight Kim. Added this one to my wishlist. It sounds fascinating and exactly what I was looking forward prior to my own trip to Cambodia last year. Unfortunately, my local library had little on the country outside memoirs about the Pol Pot era. Most of my reading ended up focusing on the other countries I was set to visit, Thailand and Cambodia. But your travel photos on Instagram (and now this post) reminded me that I wanted to read more after my trip. Sadly, memoirs about Pol Pot era are the only pieces of literature to come out of Cambodia. This sounds fascinating, I’ve hardly read anything set in Cambodia. From the discussion in the comments I now understand why so little Cambodian writing is available in translation. Pushkin Press do such a good job trying to get translated work published in the UK (and presumably this was a bit easier being written in Swedish). Definitely on my wishlist! I’d previously only read two books set in Cambodia (https://readingmattersblog.com/category/setting/cambodia/). My understanding is that little or no Cambodian literature is written in the present day because writers struggle to survive / make a living and the country has a stronger leaning towards oral stories rather than written ones. I struggle to believe that Pol Pot was motivated by a failed love affair, the radicalisation induced by secret American bombing might have had more to do with it, but I’m sure it makes for good fiction. Quite… but I think it may be one small part of a much larger and complicated puzzle rather than a sole single reason.